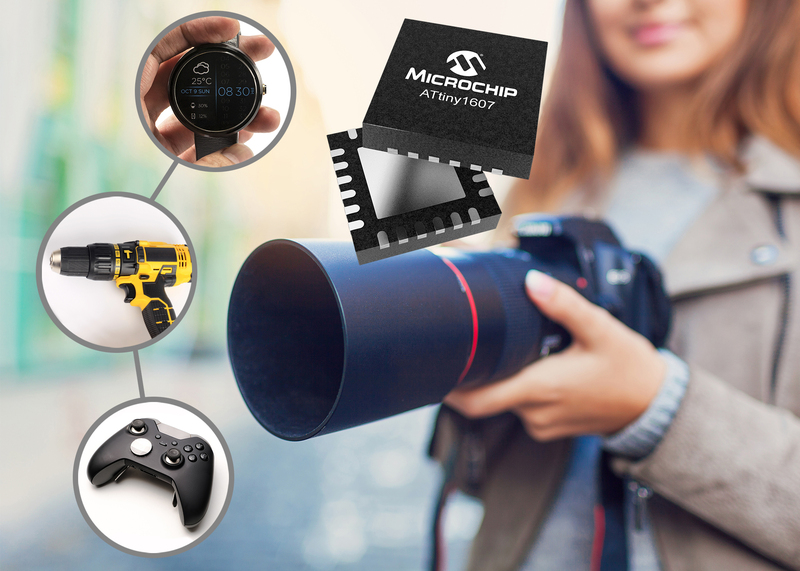 Microchip announces the introduction of new PIC18 Q10 and ATtiny1607 families of 8-bit microcontrollers (MCUs), featuring multiple intelligent Core Independent Peripherals (CIPs) that simplify development and enable a quick response time to system events. Advancements in the architecture of PIC®and AVR®MCUs have optimised these devices for implementing closed-loop control, enabling systems to offload the Central Processing Unit (CPU) to manage more tasks and save power. A key advantage of the PIC18 Q10 and ATtiny1607 MCUs are the CIPs that independently manage tasks and reduce the amount of processing required from the CPU. System designers can also save time and simplify design efforts with the hardware-based CIPs, which significantly reduce the amount of software that needs to be written and validated. Both families have features for functional safety and operate up to 5V, increasing noise immunity and providing compatibility with the majority of analogue output and digital sensors. Offered in a compact 3 x 3 mm 20-pin QFN package,the new ATtiny1607 familyis optimised for space-constrained closed-loop control systems such as hand-held power tools and remote controls. In addition to the integrated high-speed Analogue-to-Digital Converter (ADC) that provides faster conversion of analogue signals resulting in deterministic system response, the devices provide improved oscillator accuracy, allowing designers to reduce external components and save costs. Among the CIPs in the PIC18 Q10 familyare the Complementary Waveform Generator (CWG), which simplifies complex switching designs, and an integrated Analogue-to-Digital Converter with Computation (ADC2) that performs advanced calculations and filtering of data in hardware without any intervention from the core. CIPs such as these allow the CPU to execute more complex tasks, such as Human Machine Interface (HMI) controls, and remain in a low-power mode to conserve power until processing is required. All PIC18 Q10 products are supported by MPLAB® Code Configurator (MCC), a free software plug-in that provides a graphical interface to easily configure peripherals and functions. MCC is incorporated into Microchip’s downloadable MPLAB X Integrated Development Environment (IDE) and the cloud-based MPLAB Xpress IDE which eliminates the need to download software. The Curiosity High Pin Count (HPC) development board (DM164136), a fully-integrated, feature-rich rapid prototyping board, can also be used to start development with these MCUs. Rapid prototyping with the ATtiny1607 family is supported by the ATmega4809 Xplained Pro (ATmega4809-XPRO) evaluation kit. The USB-powered kit features touch buttons, LEDs and extension headers for quick setup as well as an on-board programmer/debugger that seamlessly integrates with the Atmel Studio 7 Integrated Development Environment (IDE) and Atmel START, a free online tool to configure peripherals and software that accelerates development. The PIC18 Q10 and ATtiny1607 are available today for sampling and in volume production.